What does the Nicene Creed say About Eschatology? Notice how no mention is made of hellfire or eternal conscious torment (ECT)? Notice how no mention is made at all as to what this Age to come will actually look like for anyone? Notice, however, that ECT is the accepted, unquestionable view of the vast majority of the evangelical church and when someone suggests something other than ECT, they are labelled a heretic and cast out of all evangelical circles. John Stott, who is a highly respected scholar and played a major part in defining modern evangelicalism, “came out” as not believing in ECT a few years ago, and was almost put out of organisations that he himself set up! 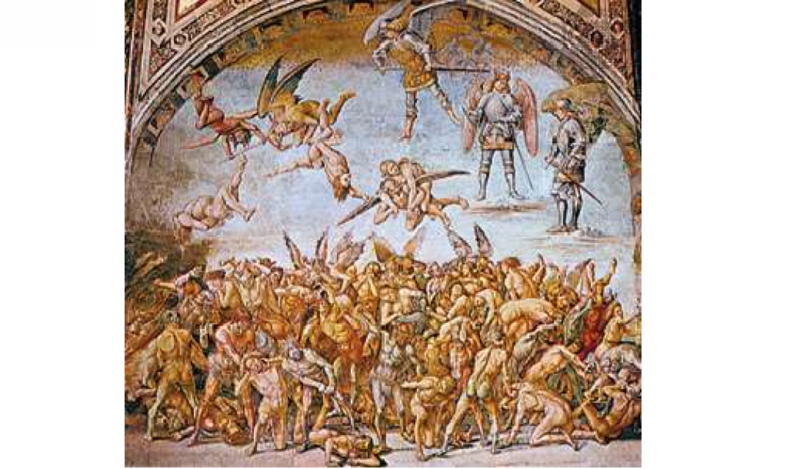 Rob Bell, in his book, “Love Wins” laid out several views of hell that are held or had been held by respected theologians throughout the history of the church. He was instantly labelled as a heretic and basically blackballed by the evangelical church. It should be noted that the criticism actually began before the book was even published and before these critics had even read it! But that is another thing. The God who made you in his own image, who knitted you together in your mother’s womb, who numbers the hairs on your head, will, if you do not believe the right things, supernaturally keep you alive for ever, just for the purposes of torturing you. This is insisted upon as the only “biblical” view of hell by many within the evangelical church. In fact Vineyard Churches has this as part of their statement of faith (one of the reasons we do not agree with it). The UK Vineyard has removed the word “conscious” from the statement, which I can only assume means that people are meant to sleep through it. This is the view that, at death, those who do not know Jesus will just simply cease to exist. This is the view held by John Stott, Greg Boyd and Steve Holmes among many. This is the view that, ultimately, all will be reconciled to Christ. It is often misrepresented as saying that there will be no consequence for anyone as all will just go “straight to heaven”. This is not, however, what Universalism is. Universalism takes the view that hell is real and those who do not know Christ will be exposed to it, but that its nature is not punitive but restorative. In other words, it is more like discipline of children for their own good. Hell is to purify those who do not know Christ in order that they can be with God. But Isn’t Scripture Clear on Hell? Where do we go for Answers? I firmly believe that Christianity is incredibly simple. The problem is that over the centuries people with agendas (like conquest or empire) and also well-meaning believers who have been unable to fully comprehend the language and context of the day, have, whether deliberately or not, heaped complications onto this simple faith. What, to a first century believer, was obvious and simple, to a twenty-first century believer seems shrouded in confusion or, worse, misunderstanding. That makes the process of getting back to that simplicity quite complicated, but it is still really important. I want to suggest that the Bible’s teaching on eschatology is simple, but that we may need to delve back into the teachings of those who spoke the language, lived in the culture and even knew the Apostles in order to discover the simple again. The second assertion is that, one of the most often quoted passages by those who espouse ETC is Matthew 25:46, is normally mistranslated. Notice how the judgement is not made on the basis of who is a believer or not, but on who has or has not done good deeds, specifically who has helped those in need. Second, the word translated as punishment is the Greek word, kolasis. There is a Greek word for punishment (timoria), but kolasis, according to ancient sources, “‘is inflicted in the interest of the sufferer’, whereas timoria is inflicted ‘in the interest of him who inflicts it, that he may obtain satisfaction. '” ( Ramelli and Konstan, Terms for Eternity: Aionios and Aidios in Classical and Christian Texts, 67). So, the passage actually reads that they will go to “corrective discipline of the age“, which is a bit different. Wow. Wait a minute. Isn’t it heresy not to believe in ECT? “The Greek-speaking Gregory of Nyssa [the “pillar of orthodoxy”], who was a Universalist and who simply assumed the purgatorial view of Gehenna, was able to unite all the various biblical images and claims in a fairly seamless synthesis in his writings, omitting nothing known to him as Christian canon. Conversely, Latin-speaking Augustine, who took very much the contrary view, was far more selective in his use of scripture, was dependant on often grossly misleading translations, and had to expend enormous energy on qualifying, rephrasing, and explaining away a host of passages that did not really conform well to the theological system he imagined he had found in Paul’s writings. This, if nothing else, is instructive.” (New Testament, 548). Obviously, this is not a very balanced piece of writing and you may begin to guess my view. It is deliberately so, however, because the ETC view dominates and is normally unquestionably assumed to be Biblical. I have come to seriously question that assumption now and have given a very brief overview of why and, although I have only barely scratched the surface, I hope that it will be enough to make you want to read more into it. The view that I have given is not new or unique but ancient and widespread and, in fact, the normal view of the Orthodox church today and for the last 2000 years (it should not be noted lightly that this branch of the church has never split or separated but is, arguably, the original church). Remember, we evangelicals only constitute 22% of that worldwide body of Christ. What I will say is that I have spent my entire 31 years of being a Christian trying desperately to reconcile the God that I see fully revealed in Jesus, who is love and whose mercy never ends with the God who keeps people alive forever for no other reason than to torture them. It is very difficult to say, “God is love, but… ” When I first became aware of other views of hell and that they are actually biblically-based and not emotional, it was like a final piece of a jigsaw being put in place. This nuanced Universalist view that there will be corrective punishment (and lets be clear, that will not be nice) but that afterwards, every knee will bow and He will reconcile all things to himself, not only gives me a fully consistent picture of God, but is the only explanation that makes sense of all passages within scripture and not just some. It seems like simple Christianity. As I said at the start, the creed only mentions four things about eschatology and none of them is ECT. The fact that it is so vague tells us that, already, the theologians of the day disagreed on the nature of it all. You may well disagree with me, and I suspect that many will and, if more people read this blog, I may even get into trouble, but nothing that I have said is heretical. For you to insist that ECT is the only correct view is to claim better knowledge than the early Church Fathers and, as I have said a few times in this series, is dangerous ground on which to stand. Terrific summary Matt. I first heard of you two days ago when I came across a copy of your book about having more questions than answers. I shall read it but a quick browse shows me much common ground with you. I am 62, live in Leicester, have been a believer since age 16, been a senior elder in an AOG church. I am an outside the box thinker. Subjects I have in recent years been majoring on are women and leadership, hell, church government and ways of operating, Replacement Theology. I have written a book on Christians and Israel and am writing one on ‘hell’ and one on the Jewish roots of our faith. There are plenty of books around on both those subjects but my style and take have their own flavour. I have family in Southampton and would love to meet you some time. As and when I can I will call your church office. Me again but this time sticking to the point! Matt is right. If you want to be treated as an outcast by many Evangelicals try telling them that you aren’t sure about Everlasting Conscious Torment/Punishment. It isn’t surprising though when you consider the mainstream translations we use and the fact that Church History is very much a minority interest. Many Evangelical commentators are conflating the findings of those who are investigating hell and wrestling with interpretive and linguistic issues with the general secularisation and liberalism of society at large. This is a misunderstanding but there is so much heat in the debate. I found Robin Parry’s ‘The Evangelical Universalist’ very helpful but felt he failed to explain adequately how he, an ex-annihilationist, would deal with the texts that annihilationists rely on for their case. I shall try Brad Jersak’s book. ‘The Fire that Consumes’ by Edward Fudge is tour de force. He is an Annihilationist. At the moment I stand with Steve Gregg and the late J Paterson-Smythe, both of whom looked at these issues for 25 and 48 years respectively but failed to reach an absolute definitive conclusion. I am still on a journey with it though.